@Islamic_ProtoAbu Jandal, Twitter, accessed June 23, 2015, https://twitter.com/Islamic_Proto. @ProJ_000Abu Jandal, Twitter, accessed April 14, 2016, https://twitter.com/ProJ_000. @ProJ32Abu Jandal, Twitter, accessed October 4, 2015, https://twitter.com/ProJ32. @Protocol_JihadJihadi Jean, Twitter post, February 10, 2015, 8:55 a.m., https://twitter.com/JihadiJean/status/565146971741364224. @protocolaseerAbu Jandal, Twitter, accessed August 28, 2015, https://twitter.com/protocolaseer. @ProtocolJihadSon of Iblis, Twitter post, November 24, 2014, 12:54 p.m.,https://twitter.com/InfidelScotsman/status/536940853982662657. @ProtocolJihad01CEP, “ISIS Supporters & Other Extremists Respond to Paris Terror Attack,” Storify, January 2015, https://storify.com/CEP/isis-supporters-respond-to-paris-terror-attack. @ProtocolJihad_1Asafu ibn Tumart, Twitter post, February 12, 2015, 1:49 a.m., https://twitter.com/SeigiNoMeikata/status/565764689619988482. @protocolj1hadAbu Jandal, Twitter, accessed September 17, 2015, https://twitter.com/protocolj1had. @Protocol1slamAbu Jandal, Twitter, accessed August 28, 2015, https://twitter.com/Protocol1slam. @ProtocolKhilafaAbu Jandal, Twitter, accessed October 8, 2015, https://twitter.com/ProtocolKhilafa. @protocolribaatAbu Jandal, Twitter, accessed July 28, 2015, https://twitter.com/protocolribaat. @protocolshami_1Jihadi Jean, Twitter post, February 10, 2015, 8:55 a.m., https://twitter.com/JihadiJean/status/565146971741364224. @protocol_siyaamDidi Beachbum, Twitter post, February 5, 2015, 8:10 p.m., https://twitter.com/didibeachbum2/status/563505048915689473. @ProtocolSiyaam_Abu Jandal, Twitter, accessed June 23, 2015, https://twitter.com/protocol_siyaam. @protocolsofqadrAbu Jandal, Twitter post, July 3, 2015, 12:16 p.m., https://twitter.com/ProtocolSiyaam_/status/617049230654472193. Twitter personality “Abu Jandal” is a propagandist for ISIS. Twitter personality “Abu Jandal” is a propagandist for ISIS. Jandal uses Twitter as a platform to advocate support for ISIS as well as promote other extremist accounts.Abu Jandal, Twitter, accessed June 23, 2015, https://twitter.com/Islamic_Proto. Under previous iterations of the account, Abu Jandal has condoned violence against civilians, including the victims of Paris’s January 2015 Charlie Hebdo attacks. CEP, “ISIS Supporters & Other Extremists Respond to Paris Terror Attack,” Storify, January 2015, https://storify.com/CEP/isis-supporters-respond-to-paris-terror-attack. Abu Jandal has, in the past, maintained public and private accounts. From his private @Islamic_Proto account, Jandal has promoted his public @protocol_siyaam account.Abu Jandal, Twitter post, June 19, 2015, 3:08 p.m., https://twitter.com/Islamic_Proto/status/612019121132314624. Under both accounts, Abu Jandal frequently tweets in support of ISIS, publishing posts such as, “#IslamicState looks after & cares for the health of its residents!”Abu Jandal, Twitter post, May 10, 2015, 4:01 a.m., https://twitter.com/Islamic_Proto/status/597355841382125569. and “SubhanAllah Alhamdulilah a pledge of Allegiance to the Islamic State from the Caucasus! Kuffar drowning in rage!”Abu Jandal, Twitter post, June 21, 2015, https://twitter.com/protocol_siyaam/status/612592359772176384. 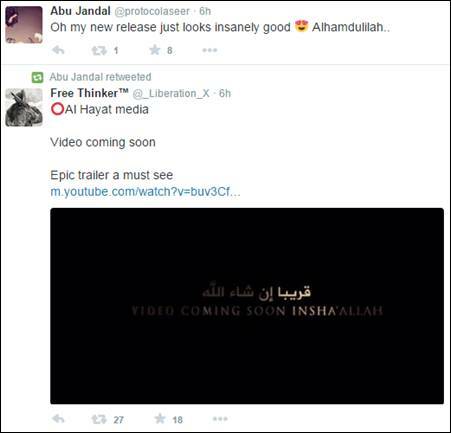 On August 28, 2015, Abu Jandal—under the handle @protocolaseer—tweeted out a trailer for what was then the newest video to come from ISIS’s Al Hayat media center. Following the post, Abu Jandal wrote, “Oh my new release just looks insanely good Alhamdulilah.. [praise Allah].”Abu Jandal, Twitter post, August 28, 2015, https://twitter.com/protocolaseer/status/637283637231243264. Series of tweets posted on August 28, 2015. Among a score of others, Abu Jandal has interacted with extremist propagandist Hallie Sheikh. Jandal has also promoted other extremist accounts, including that of Mizanur Rahman, known on Twitter as Abu Baraa.Abu Jandal, Twitter post, May 8, 2015, 6:35 a.m., https://twitter.com/Islamic_Proto/status/596669826850017281. While Abu Jandal does not disclose his/her location, the propagandist occasionally uses “we” when referring to ISIS, hinting that he/she may live in ISIS-controlled territory. CEP believes that Abu Jandal may have once operated out of the United Kingdom, based on the propagandist’s writing style and references made to the U.K. policeAbu Jandal, Twitter post, June 20, 2015, 8:52 p.m., https://twitter.com/protocol_siyaam/status/612422819268456448. and an event in Cambridge.Abu Jandal, Twitter post, June 21, 2015, 8:06 a.m., https://twitter.com/protocol_siyaam/status/612592359772176384. “Islamic State have water conservation projects in wilayatul khair… #islamicwelfarestate”Abu Jandal, Twitter, accessed September 9, 2015, https://twitter.com/protocolj1had/status/641610165561729024. “Fallujah Prices: Dinars tomato ‘5kg’ 1,000 D potatoes ‘1 Kilo’ 500 D watermelon ‘1 kilo’ 750 D Beef ‘1 kilo’ 3,000 D Iraqi Dinar = 0.0084USD” (Tweet)Abu Jandal, Twitter, accessed August 13, 2015, https://twitter.com/protocolribaat. “Greece under IS –Debts wiped clean –Money in the banks will be returned to the people & only pay jizya 2% -No more suffering Give Bayah now” (Tweet)Abu Jandal, Twitter, accessed August 13, 2015, https://twitter.com/protocolribaat. “Why have i not been suspended yet.. [sic]” (Tweet)Abu Jandal, Twitter, accessed August 13, 2015, https://twitter.com/protocolribaat. “Slowly but surely the hadith is being fulfilled. 70 countries against the IS heading towards final conflict @ Daqbiq.”Abu Jandal, Twitter post, June 22, 2015, 8:03 a.m., https://twitter.com/protocol_siyaam/status/612954026590760960. “Alhamdulillah a lithuanian sister took her shahada today at dawah stall in Cambridge! AllahuAkbar! May Allah keep her steadfast! #Islam” (Tweet)Abu Jandal, Twitter, accessed August 13, 2015, https://twitter.com/protocolribaat. “Only the 4th day of Ramadhan & Allah has granted IS a huge victory with Wilayah Qawqaz. Alhamdulilah we still have 26 days. Lots of duas pls”Abu Jandal, Twitter post, June 21, 2015, 12:39 p.m., https://twitter.com/protocol_siyaam/status/612661220781490176. “SubhanAllah even getting blocked by twitter from following accounts.”Abu Jandal, Twitter post, June 19, 2015, 6:02 p.m., https://twitter.com/protocol_siyaam/status/612017578828021760. “Asapaamualaikum brothers & sisters got susepended. Please follow back inshaAllah jazakAllah khair. May Allah bless you all...”Abu Jandal, Twitter post, June 19, 2015, 5:35 p.m., https://twitter.com/protocol_siyaam/status/612010724232196096. 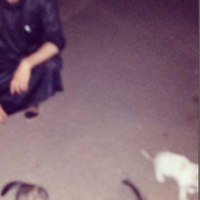 “#IslamicState looks after & cares for the health of its residents!”Abu Jandal, Twitter post, May 10, 2015, 4:01 a.m., https://twitter.com/Islamic_Proto/status/597355841382125569. “You cant change the fact u HAVE to use fiat based currency but you do have the choice to vote. #StayMuslimDontVote”Abu Jandal, Twitter post, May 7, 2015, 6:44 a.m., https://twitter.com/Islamic_Proto/status/596309569506258945. “@Haliisheikh Allah decended his lions on the filthy french magazines who Insulted our Prophet peace be upon him! Alhamdulilah!”CEP, “ISIS Supporters & Other Extremists Respond to Paris Terror Attack,” Storify, January 2015, https://storify.com/CEP/isis-supporters-respond-to-paris-terror-attack.